Every living being is alive for autopoietic mechanisms (Maturana and Varela 1980) that coupled with the (teleonomic) genomic project assures the internal homeostasis and the necessary contact with the external world. Such contact is based on perception and cognition that must be continuously in action to gain the maximum of the information possible. The maintenance of the autopoiesis requires "fuel" that consists of matter (e.g. food), energy (e.g. light), and information (e.g. sound) that we call in a generic way "resources." Under the paradigmatic framework of the cognitive landscape a special place can be reserved for the General Theory of Resources (Farina, in preparation). This theory states that the deficit of matter, energy, and information that every living system feels, in order to stay alive, namely "needs," represents the major stream of life, the goal of every living being and that it is accomplished through specific functions able to intercept the requested resources, via bio-semiotic mechanisms. The use of matter, energy, and information is not episodic but requires a continuous process of resource access and resource "re-fueling." For this reason every living being needs a source able to re-source after use. A resource, after every depletion episode must have the capacity to recover and to be available for a successive depletion, entering into a depletion-recovery cycle. The time lag for resource recovering, when regularly fixed, produces rhythms. 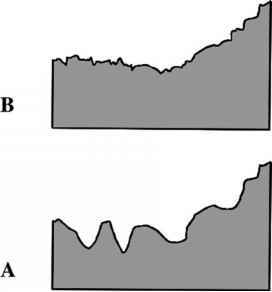 In nature rhythms exist as reply to the time interval requested for the regeneration of the resources. The use of resources is connected and timed with the metabolism of organisms, as well. In order to be localized, every resource must have some regularities that allow a recognition by the users. Regularity means information (see more details in Harms 2006) and when the resource enters into a sign circle with the living being such a relationship is of semethic type (see Hoffmeyer 2008 for more details). The heterogeneous distribution of resources in space and time and their scarcity require accurate mechanisms of interception to limit the energy demanded to explore the range to intercept resources. According to the level of indispensability resources can be classified as: compulsory, optional, and marginal. For example, water, food, and air are compulsory. The optional resources include categories of food such as fruit for a diet-generalist species. Marginal are resources like a glass of bier for a man whose availability improves his quality of life a little. Most resources belonging to information are optional or marginal but their shortage produces a bad-being status. The Etruscan shrew (Suncus etruscus), the smallest (by mass) known mammal in the world (8 g), requires to stay alive, when caged, contact with the surface of the soil around its body otherwise this micromammal enters a stress status, which in a short time can accelerate towards a death event. The eco-field described as a spatial configuration carrier of meaning specific for every semethic organism-resource interaction, is a central concept in the General Theory of Resources. The presence of a specific eco-field per se is not enough to guarantee the resources. In fact it is possible to have a suitable eco-field but a lack of the correspondent resource. This condition is well known in ecology and is described as an "ecological trap." For instance, many species of birds nest inside the orchards of vineyards. The orchards probably look very attractive to the birds, but few are successful here because of disturbance by cultivation practices (spraying or green pruning). The "safety" resource is not achieved despite a favorable nesting eco-field, i.e., the dense cover of leaves to hide the nest in and many branches on which to anchor the nesting cup. By adopting the niche-construction strategy (Odling-Smee et al. 2003) many organisms improve strategies of resource-tracking by adopting a very special type of resource cultivation. For instance, wild boars plough the soil stimulating growth of specific vegetables particularly preferred in their diet. The abundance of the resources is not a sufficient condition to guarantee well-being, often resources enter into competition with each other and a tradeoff is necessary (Fig. 8.9). For instance the "food" resource and the "safety" resource in many cases enter into competition. Experimental evidences have demonstrated that food resources when located in unsafe locations are ignored producing a malnutrition status in organisms. This vision is otherwise interpreted according to the source-sink model (Pulliam 1988, 1996). According to the bio-semiotic process involved, resources can be classified into: direct and indirect. The direct bio-semiotic process involves only one step in signification. The indirect bio-semiotic process requires at least two consecutive steps. Food catching involves only one sign process, but to enjoy the fresh air in an urban park requires one to walk. (shade) are two resources that when produced by the same tree can't be used contemporarily. If you use the biomass for feeding the refreshment (resource) disappears. We can say that the two resources enter into competition. When the same resource is utilized by two or more species, those species enter into competition. 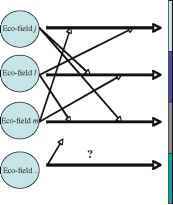 This means that each species probably adopts the same eco-field. Evolution acts inside this process reducing the competition for the resources. When a resource becomes neglected generally the correspondent eco-field vanishes as well. This is the case with most local types of fruits and cultivated seeds. Disuse of the resources produces the disappearance of the correspondent eco-field. When many resources are neglected at the same time, like the rural products in mountainous areas, all the correspondent eco-fields disappear. If we consider that the summation of all the eco-fields of species creates a cognitive landscape, the transformation of the landscape is the consequence of resource disuse. When a living being reaches every necessary resource this condition produces a state of well-being. Conversely when some resources are no more available the living being enters into a state of bad-being. Well- and bad-being are important indicators of the life style of our societies. The general theory of resources can be effectively adopted to interpret human habits but with some precautions. In natural systems resources are tracked inside the home range by every organism in order to reduce the energetic demand. In such a way, an individual species lives where resources exist. This is not always true for humans that have the technological and energetic capacity to gain access to resources far from their home range (Commune, Region, Country, and Continent). Tracking resources from other "territories" requires a lot of energy and this process subtracts such resources from the local populations causing social and economic problems. Some resources are only potentially and vaguely expected. They can be localized only by adopting cultural tools. This is the case of biodiversity. Biodiversity is a potential source of goods and services for humanity but a lot of cultural information is requested to evaluate this emergent entity. The General Theory of Resources allows one to incorporate matter, energy, and information into a unique epistemological domain and to create a good context to interpret the ecological landscape. This theory recognizes the resource flux from outside to inside the major teleonomic habits of every organism and it opens a wide window also to the philosophical interpretation of the mechanisms adopted by every living being to stay alive.